Grab a spoon! 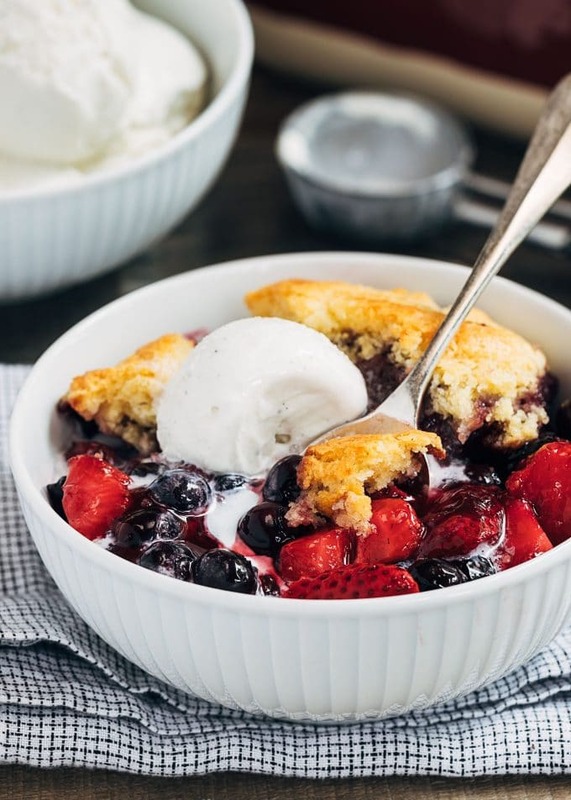 This Mixed Berry Cobbler with Cornbread Biscuit Topping is an easy-to-make, comforting summer dessert that’s perfectly-served with a scoop of vanilla ice cream. 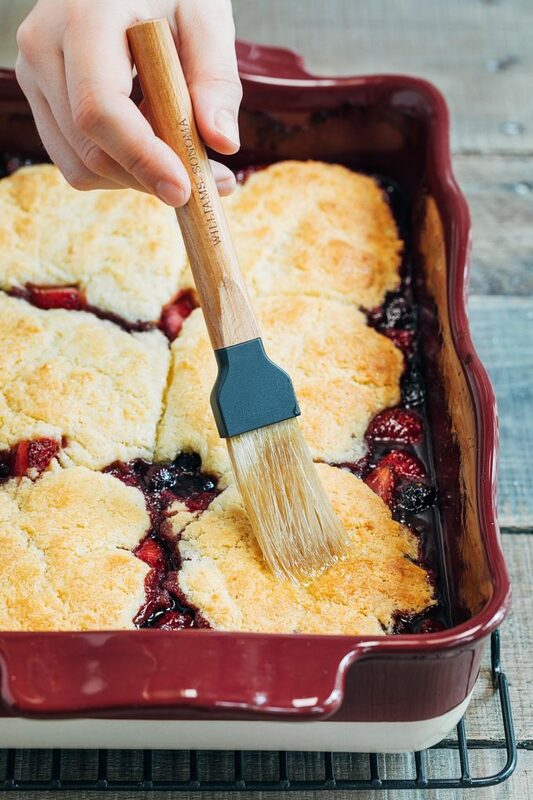 Is there anything more homey than a warm, biscuit-topped cobbler during the summer months? It’s such a great way to turn ripe, juicy fruit into a dessert that you want to cozy up to, with a scoop of ice cream, (maybe in front of a fire pit?) under a starry summer sky. Classic. I recently had a nice quantity of strawberries and blueberries in the fridge, and I knew I had to turn them into a cobbler. 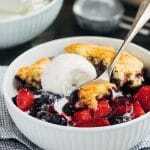 Not just any cobbler, though: Berry Cobbler with Cornbread Biscuit Topping! 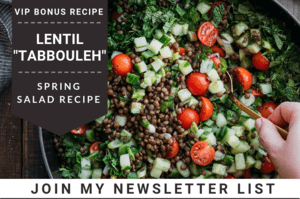 If you’ve been reading Striped Spatula for a while, you’ll know that I like to create twists on classic recipes. Buttermilk Biscuit Cobbler is one of my favorite desserts. I also love cornbread. So, I thought it would be fun to add some cornmeal to my biscuit topping to bring some of that cornbread texture and flavor to the dish. Brushed with a little honey butter after baking, the light, fluffy buttermilk cornbread biscuits paired perfectly with the berry cobbler filling. So good! Cobblers are desserts that consist of fruit, baked with a biscuit, batter, or sometimes, a cookie-esque topping. Styles of of cobblers tend to vary by region, and you can make them with just about any stone fruit or berry. In some areas of the Southern United States, cobblers made by pouring a sweetened batter into a baking dish with butter, and then layering fruit, such as sliced peaches, over it. The batter then bakes up around and partially over the fruit. Biscuit cobblers, such as this berry cobbler recipe, place either rolled or dropped biscuit dough over a mixture of fruit. They’re baked until the biscuits are golden and the fruit is bubbling. The fruit you choose to use in a biscuit-style cobbler is most often tossed with sugar and a thickener, like cornstarch. The cornstarch helps to turn the fruit juices to a syrup as the cobbler bakes. As the juices release and the fruit bubbles up, they soak into the biscuits on top a bit. Heavenly. Cookie cobblers are made like biscuit cobblers, but dollop a sugar cookie dough onto the top of the fruit to create a crust. This cobbler topping will be crisper than a biscuit topping. Is a cobbler the same as a fruit crisp or crumble? Cobblers, crisps, and crumbles are distinct desserts, though the latter two are often used interchangeably. Crisps and crumbles have a similar fruit filling to a cookie or biscuit cobbler, but are topped with streusel. Traditionally, the streusel topping for crisps contains oats, while crumble toppings do not (though, this is no longer a steadfast distinction). To make the cornbread biscuit topping for my mixed berry cobbler, I borrowed a technique for drop biscuits that I learned years ago from Cook’s Illustrated. 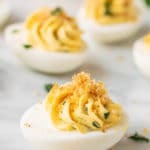 The secret is a combination of melted butter and chilled buttermilk. Most classic biscuit recipes will have you cut chilled butter into the dry ingredients with a pastry blender, or use grated frozen butter. These techniques are great, but for easy drop biscuits, Cook’s Illustrated had a much faster technique: stir cold, shaken buttermilk into cooled, melted butter. By mixing the room temperature butter with the cold buttermilk, the butter clumps into tiny butter pieces. Similar to the texture you get when you cut butter into flour, these little butter clumps keep the biscuit dough light and fluffy. The butter and buttermilk mixture will look rather curdled when combined. This is correct! Don’t worry! As the cobbler bakes, the biscuit topping will spread out over the top of the fruit and turn light golden brown. The taste of the cornmeal is delicate here; I wanted just a hint of a cornbread flavor and texture, while still keeping a fluffy biscuit cobbler feel. As these cornbread biscuits were developed to be a cobbler topping; don’t try to bake them on a baking pan as a standalone biscuit. They will spread out too much. As difficult as it is (your kitchen will smell amazing while this cobbler is baking), you need to let the cobbler cool after baking so that the juices have a chance thicken. Anywhere from 30-45 minutes will do the trick. After cooling, the cobbler will be just slightly warm and perfect for scooping. I like to serve it with vanilla bean ice cream, but lightly-sweetened whipped cream is also delicious. Like most biscuit-topped recipes, this mixed berry cobbler should be served within several hours of baking. The cornbread biscuits will become heavier in texture on day 2, and will have soaked up quite a bit of the fruit syrup. 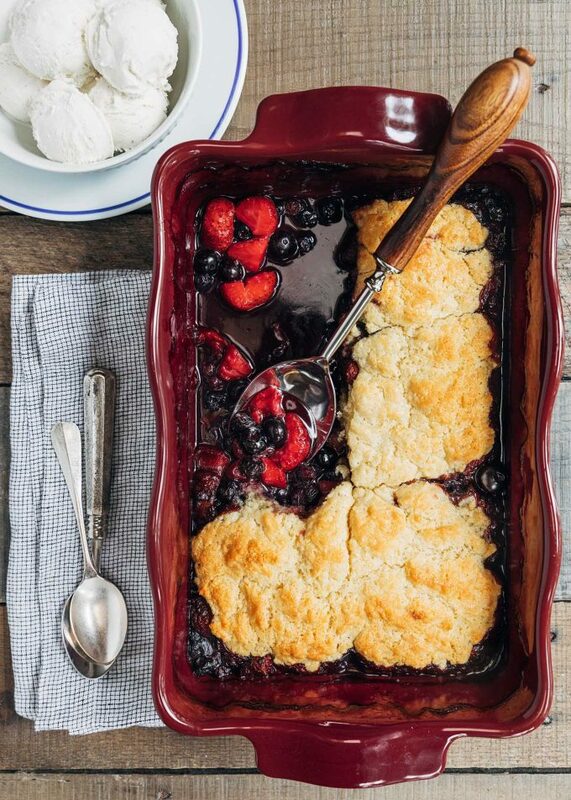 In this twist on a classic cobbler recipe, strawberries and blueberries are baked with a light and fluffy cornbread biscuit topping. A cozy summer dessert to make with fresh berries! Preheat oven to 375 degrees F with rack in the middle position. 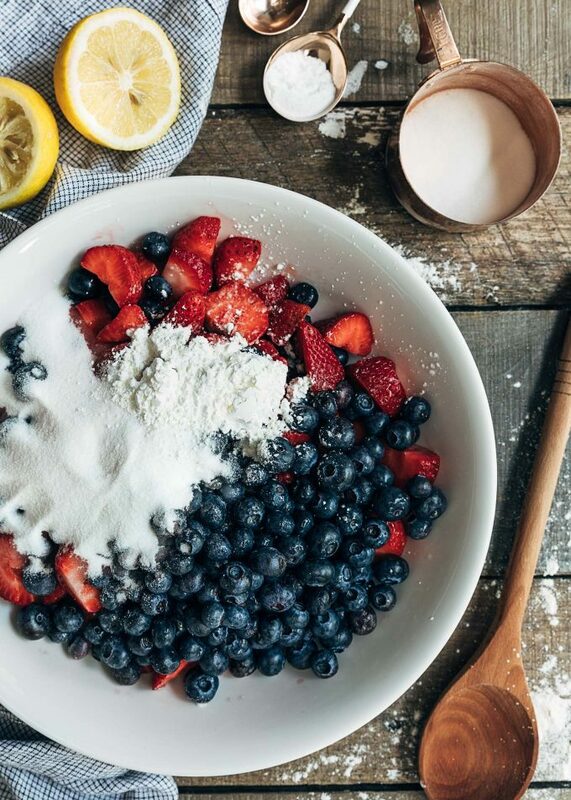 In a large bowl, toss together berries, 3/4 cup sugar, cornstarch, lemon juice, and vanilla extract. Transfer to a 13x9x2 baking dish set on a baking sheet (in case any fruit juices spill over). 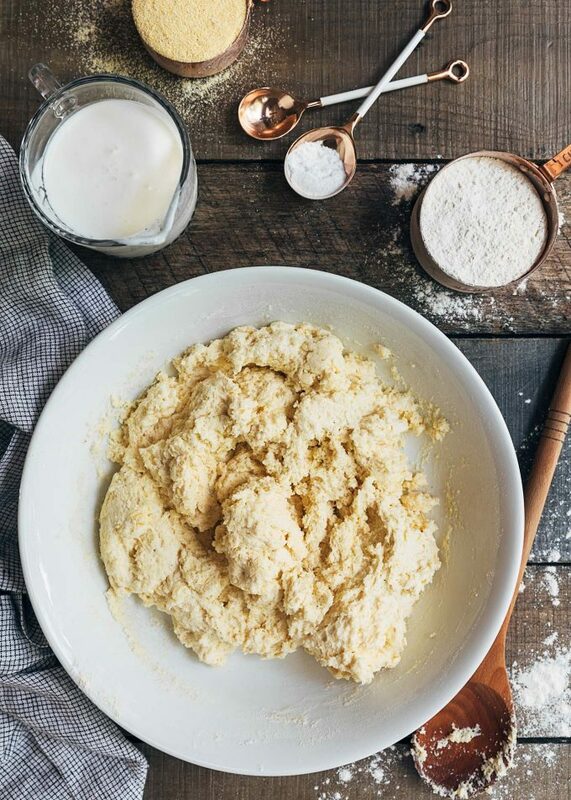 Whisk together flour, cornmeal, 2 tablespoons sugar, baking powder, baking soda, and table salt. Add cooled melted butter to chilled buttermilk. Stir until small butter clumps form. Stir butter and buttermilk mixture into the dry ingredients until just combined. Drop biscuits over the fruit filling using heaping spoonfuls. Flatten just slightly with the back of your spoon to promote even baking. Topping will spread as it bakes. Bake cobbler for 40-45 minutes, until filling is bubbling and topping is browned. Filling will thicken as it cools. While cobbler is baking, melt together 1 tablespoon unsalted butter and the honey. Remove cobbler from oven and brush the biscuits with the honey butter mixture. Let cobbler cool for 30-45 minutes, until just warm (cobbler is best served within a few hours of being made). 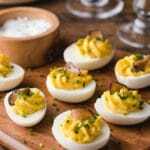 Spoon into bowls and serve with vanilla ice cream or whipped cream. You can also make this cobbler with blackberries or peaches! I find that raspberries are a bit too delicate and cook down too much before the biscuit topping is cooked. Absolutely stunning! 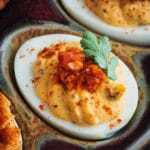 I’ve pinned it to my ‘Old School Recipe Love’ board and am now drooling on my keyboard. These photos make me want to dig right in. What a great old-fashioned dessert!! They are the best. The berries look so good and juicy and the cornbread biscuits on top are the perfect sponge for the delicious fruit juice. The Farmer’s Market still has plenty of fruit — this would be a great dessert for Labor Day. I’ve never had a cobbler with flaky biscuits on top before—just batter—and hot dayum. I need to change that stat. This looks amazing! I can just imagine the flaky and buttery biscuits on top of those sweet and gooey berries. GIMME! Biscuit cobblers are my favorite and this looks amazing! I love your video, it is so well done and the pictures are beautiful. This is the perfect way to enjoy the last of the summer berries. Oooh, all that beautiful fruit looks so good! I could sit down to bowl of cobbler right now, especially with a scoop of ice cream. Yum! I love all the rustic American fruit desserts. That is one thing we (as Americans) do very well whether we’re making cobblers, crisps, grunts, or any of the others. And the cornmeal you added to the topping sounds perfect for adding some great texture and flavor to the biscuits. Confession time: I’ve never made a cobbler before. Plenty of crisp and crumbles, but no cobbler. I think it gets overlooked here (Canada) because it’s perceived to be a more American sort of dish. But man, it’s so easy and tasty… and my carb-loving soul is definitely on board with biscuity-goodness to go along with all that summer fruit. Thanks for the tips on making the cornbread too, as it’s been a while since I made it. Now, to get some reallllly good vanilla ice cream to go along with this…. This is the dessert we NEED. I can’t wait to try this new cobbler with the corn bread topping! Thanks for the tip with the combining of melted butter and chilled buttermilk. I’m not a baker by nature so a lot of these tricks are lost on me if someone doesn’t tell me exactly what to do! 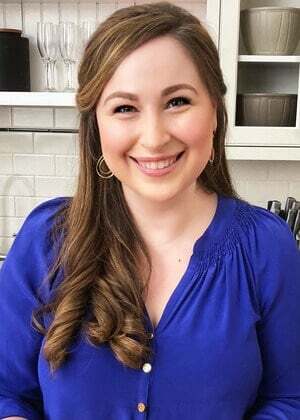 That description of eating the cobbler in front of a fire pit – oh my! you just transported me there! I always say that food is the ultimate time-travel machine! And the buttermilk and melted butter technique? Genius! I am definitely going to try it! LOVE all of your twists on classics! That cornbread topping is GENIUS. Have you made it with other fruits, too? 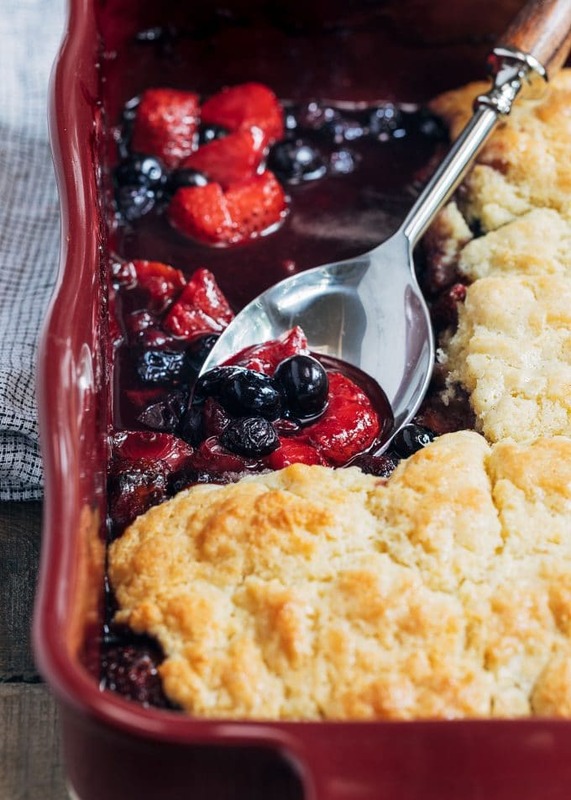 Love, love, love the idea of using cornbread on top of a cobbler. Why hadn’t I ever thought of that? Another great idea for the berries that I just can’t seem to get enough of. 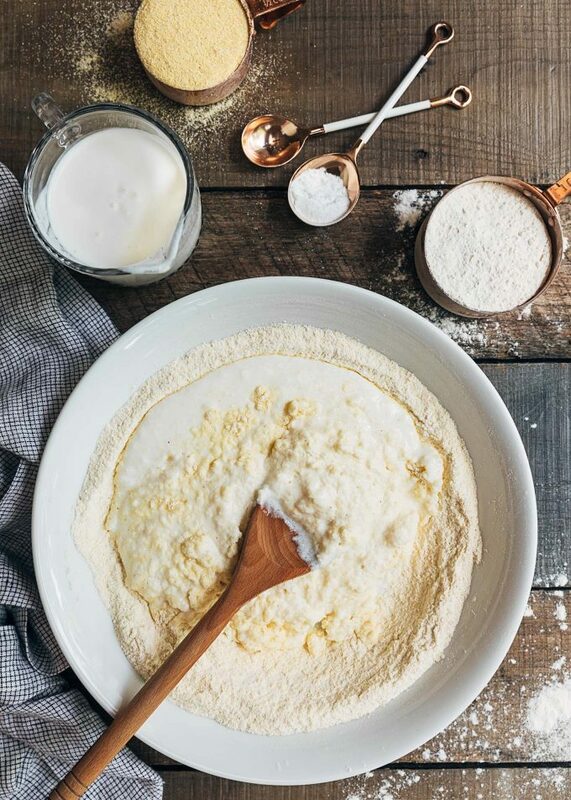 You have such beautiful photos of the process that it makes me feel like I’m in the kitchen with you, baking. I’ve only had a handful of cobblers in my life — my family tends to go to the streusel-y crisp end of the spectrum, but the cornmeal topping has me really intrigued. As a child of the South, I love cornbread and your twist on this cobbler is definitely in my wheelhouse. Great tip on mixing the melted butter with cold buttermilk too. I’m going to remember that on. 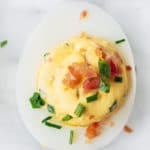 This recipe is on my end-of-summer MAKE list! I absolutely adore the idea of using cornbread on a cobbler! I bet it has just the right amount of savory– LOVE! I need to try this before the summer turns into fall! This is my kind of dessert. Rustic, easy to make…and that cornbread crust sounds amazing. We are hosting a BBQ next weekend. This just might be the dessert. Sounds like a good plan to me. I know the guests would love this.